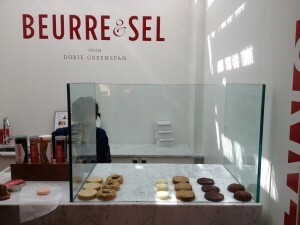 Dorie Greenspan has published almost a dozen dessert cookbooks, including one co-authored with Julia Child. She recently opened a tiny storefront in the Essex Street Market in Manhattan, so it was my first stop during a my weekend visit to NYC. There were only 6 varieties available, so Wendy and I sampled a World Peace cookie, a chocolate cherry chunker and a blueberry jammer. It seems that most of the cookies use a sable (French shortbread) dough as a foundation. Their iconic World Peace cookie is not much more than a chocolate shortbread cookie sprinkled with finishing salt – I was underwhelmed. 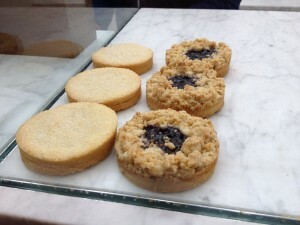 The blueberry jammer used a sable base, jam filling with a brown sugar streusel topping. It was like a miniature blueberry tart. I liked it, but wasn’t wowed by it. I thought the chocolate cherry chunker was the best in the brunch – thick, chocolaty, studded with cherries. The cookies are extremely expensive; the three cost me almost $10. I think I’ll stick to using her recipes to make my own. I needed something savory to counteract the cookies, so I stopped for a spinach pie ($4) at Boubouki, another small food stall in the market. 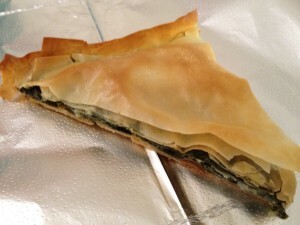 I had a generous triangle of phyllo, spinach and feta. It was a tad greasy, but it hit the spot.